Fan-filmed video footage of VENOM — the legendary, hugely influential British heavy metal trio — performing a new song, “100 Miles To Hell”, on December 16 at the Eindhoven Metal Meeting in Eindhoven, The Netherlands can be seen below. 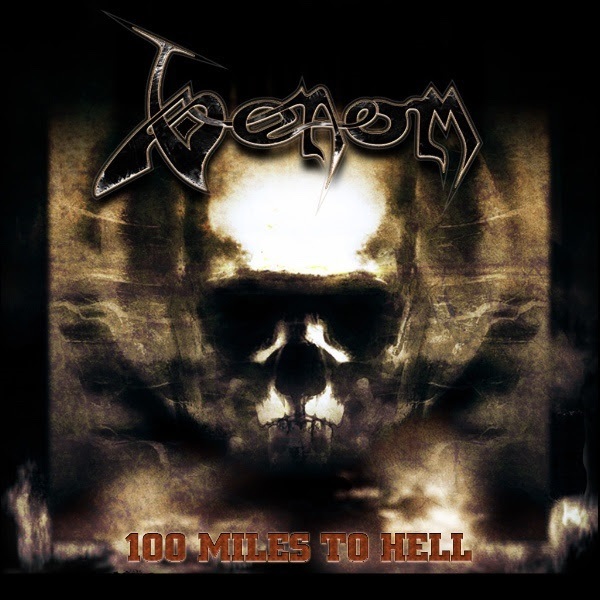 “100 Miles To Hell” is the title track of VENOM‘s new three-track EP, which will be released digitally through Spinefarm Records on December 22. It will be available via D2C basis on January 19 in the U.S.
“100 Miles To Hell” features three brand new studio recordings: “We The Loud”, “Beaten To A Pulp” and the title track. It marks the first “fresh” VENOM material since the “From The Very Depths” studio album, which arrived in 2015. In terms of music, lyrics, and artwork, the “100 Miles To Hell” package is cast in the classic VENOM mold, pushing all of the buttons (and turning all of the crosses) you’d expect from a band led into action by vocalist/bassist/producer and original VENOM titan, Conrad “Cronos” Lant — an iconic performer whose ability to fuse the attitude of punk with the power of metal has long been a signature of the nefarious VENOM sound. VENOM is not to be confused with VENOM INC., the band featuring original VENOM members Jeff “Mantas” Dunn (guitar) and Anthony “Abaddon” Bray (drums) alongside ex-VENOM bassist/vocalist Tony “Demolition Man” Dolan.